This weekend was all about catching up on stuff, and while I'm not quite where I want to be, I'm definitely more caught up than I was last week. I got the first sleeve of Chaverim finished, and I am so pleased with it. This is really the most fun part of the sweater, and I'm just absolutely tickled with how it turned out. I wanted the cuff to look like a huge stack of friendship bracelets, and I think that's exactly what it looks like. The second sleeve is moving along nicely- I picked up the stitches last night before bed and managed to knit an inch or so before I passed out. I'm hoping to get the sweater totally done this week, but we'll have to see how that works out. 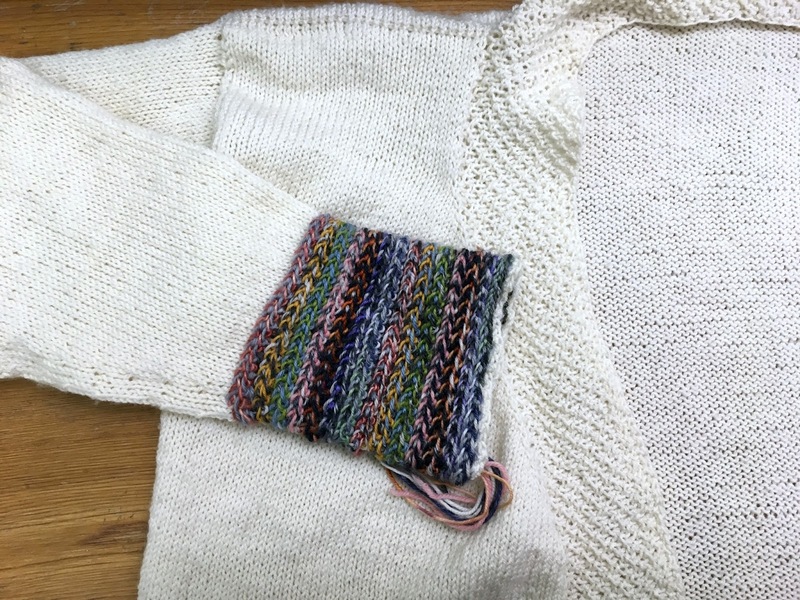 The cuffs are a bit fiddly and time consuming with the color changes, but it's so worth it, even if it makes the sweater not very portable for the final stages. I didn't manage to get a pattern draft written before my vacation the other week, so that's my goal for this weekend. holy smokes that is a gorgeous cuff!! Is it a Latvian braid type of stitch? looks amazing! I really like that cuff. It's very classy looking. You definitely achieved your goals with that cuff, beautiful!